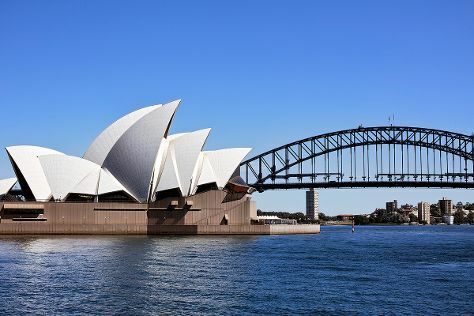 Your list of things to see and do now includes The London Hotel, Bar Eleven, roof top Bar, sydney, Sydney Harbour Boat Tours, and other attractions. There's much more to do: see a show at Sydney Opera House, take a stroll through Darling Harbour, enjoy the sand and surf at Bondi Beach, and get to know the fascinating history of The Rocks. To find ratings, traveler tips, photos, and other tourist information, you can read our Sydney trip planner . Manchester, UK to Sydney is an approximately 25-hour flight. You can also do a combination of flight and train. The time zone difference when traveling from Manchester to Sydney is 10 hours. Traveling from Manchester in April, expect Sydney to be somewhat warmer, temps between 26°C and 17°C. Finish your sightseeing early on the 8th (Mon) so you can travel to Melbourne. Go for a jaunt from Melbourne to Torquay to see The Great Ocean Road about 1h 40 min away. There's much more to do: soar above the sights with a balloon tour, steep yourself in history at Old Melbourne Gaol, and take in panoramic vistas at Eureka Skydeck 88. Fly from Sydney to Melbourne in 3.5 hours. Alternatively, you can do a combination of flight and shuttle; or drive. Prepare for slightly colder weather when traveling from Sydney in April: high temperatures in Melbourne hover around 23°C and lows are around 11°C. On the 15th (Mon), you'll travel to Gold Coast. Your day-by-day itinerary now includes SkyPoint Observation Deck as well as Lone Pine Koala Sanctuary. Kick off your visit on the 15th (Mon): look for all kinds of wild species at Lone Pine Koala Sanctuary and then take in panoramic vistas at SkyPoint Observation Deck. Keep things going the next day: get in on the family fun at Warner Bros. Movie World and then enjoy the sand and surf at Surfers Paradise Beach. To find photos, traveler tips, maps, and tourist information, go to the Gold Coast trip itinerary builder app . You can fly from Melbourne to Gold Coast in 4 hours. Other options are to do a combination of flight and train; or drive. 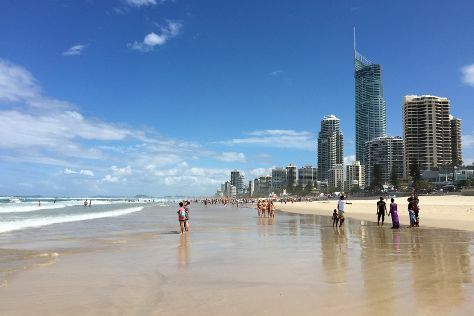 Prepare for a bit warmer weather when traveling from Melbourne in April: high temperatures in Gold Coast hover around 30°C and lows are around 19°C. Wrap up your sightseeing on the 17th (Wed) early enough to travel to Hamilton Island. Your day-by-day itinerary now includes Pool Bar, Bommie Deck and One Tree Hill Sunset Cocktails. Spend the 18th (Thu) among aquatic life with a scuba or snorkeling tour. There's still lots to do: enjoy the sand and surf at Catseye Beach, get outside with Jetryder, and take in the waterfront activity at Hamilton Island Marina. To find more things to do, where to stay, photos, and other tourist information, read our Hamilton Island driving holiday planning tool . Traveling by combination of train and flight from Gold Coast to Hamilton Island takes 5 hours. Alternatively, you can do a combination of train, bus, and ferry; or do a combination of bus and ferry. Traveling from Gold Coast in April, Hamilton Island is a bit warmer at night with lows of 26°C. Finish up your sightseeing early on the 19th (Fri) so you can travel to Port Douglas. You've added Jimmy Rum's, Flames of the Forest, Four Mile Beach, and other attractions to your itinerary. The adventure continues: identify plant and animal life at Wildlife Areas and admire all the interesting features of Hartley's Crocodile Adventures. For ratings, other places to visit, reviews, and tourist information, read Port Douglas trip planner . You can do a combination of flight and shuttle from Hamilton Island to Port Douglas in 3.5 hours. Alternatively, you can do a combination of ferry and bus; or do a combination of ferry, bus, and train. Expect a daytime high around 34°C in April, and nighttime lows around 25°C. Wrap up your sightseeing by early afternoon on the 22nd (Mon) to allow time for travel back home.